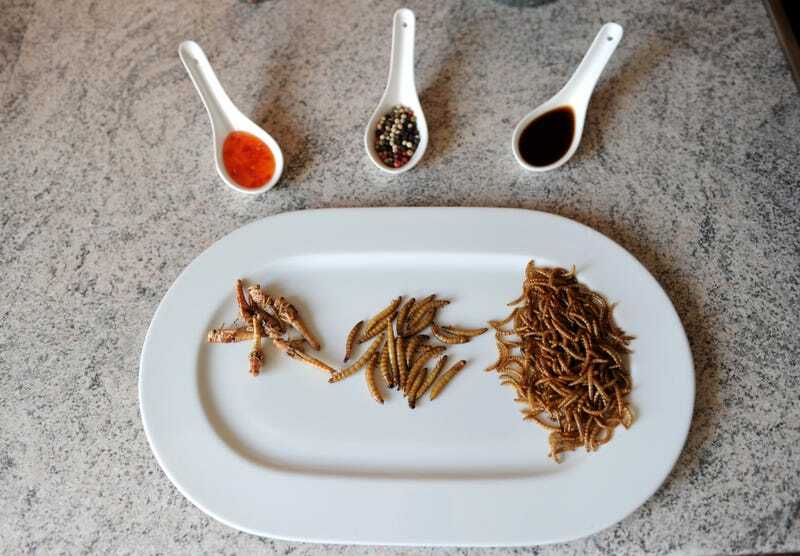 Is This How We'll Convince The World To Eat Bugs? I’m open to the idea of people eating bugs for protein in the long run, and not just for the cheap novelty of Let’s eat some freakin’ creepy-crawlies!!!! You can set aside any issues of animal cruelty and still acknowledge that the meat industry overtaxes lots of resources—land, water, feed crop that must itself be sustained by land and water and sun and labor, and so on—enough that it’s worth exploring other options. This rings especially true as the human population explodes to a projected 9 billion by 2030, leaving us with less room on this little earth for all that future-meat to roam and more human mouths to feed. The usual case for insects could be crudely summarized this way: Insects demand far less resources like land and water to farm, convert feed more efficiently into edible protein and nutrients, and can be fed all kinds of waste rather than feed that itself could be eaten by us and other animals. A 2015 study on crickets pushed back against those last two claims, though, demonstrating that you sadly can’t feed bugs straight-up garbage—“food waste and diets composed largely of straw”—and watch them thrive to harvestable size, and also that crickets, when fed poultry feed, converted feed to dietary protein at rates comparable to chickens, but not dramatically better. Nothing planet-saving on the horizon quite yet, as far as crickets are concerned, though as the researchers admit, there are many other bugs and possible feed sources to experiment with. If there’s a workable long-term solution, it may involve something like what’s being done now by some of the most technically capable bug experimenters, who are finding ways to extract protein from bugs and give them new forms. Take this Edible Manhattan interview with Eli and Lee Cadesky of C-Fu FOODS, who turn bug protein into tofu, along with ice cream and other dairy-imitations. Dressing up insects as a tofu block feels like an unusual strategy: since it’s still an animal product, it won’t entice the vegetarians or vegans or habitual meat-avoiders who otherwise endorse the meatless protein sources like, you know, tofu. For those eaters, insect tofu would mark a regression from their peaceful soy-based protein of choice. And aside from the few cultures who can expertly mix tofu and meat, even in the same dish (like Chinese mapo tofu), committed carnivores tend to have brutal opinions of tofu, so it’s unclear what demographic is satisfied by bug tofu, except the experimental eat-anything omnivore. Even that guy—this guy—is probably eating more out of curiosity than because it satisfies any moral stance or hope for a more sustainable future. Insect ice cream? That sounds like an easier sell. Tell all the five-year-old and/or lactose-intolerant masses that there’s bug-based soft serve on deck, and watch them flock.